Last year, God asked me to camp out in Isaiah 12 for four months. I painted this watercolor as a picture of drinking from that deep deep well. Later, a friend shared with me her watercolor, also inspired by Isaiah 12! We marveled that we had both been painting the same scripture! Now it's your turn to help us finish painting the whole chapter! Subscribers are welcome to email me a copy of your Isaiah 12 inspiration any time. The Splatter Joy team will joyfully receive it and consider adding it to the Isaiah 12 gallery! Subscribe below and send me your Isaiah 12 inspiration. 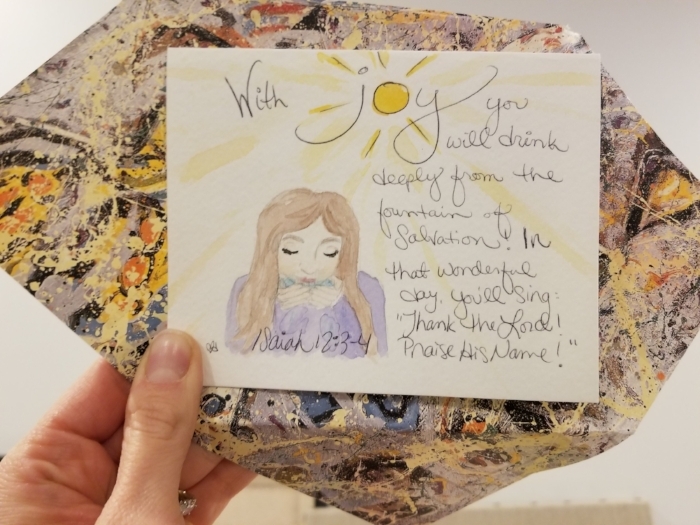 Just respond to any of my newsletters and the Splatter Joy team will rejoice and gladly consider adding your submission to the Isaiah 12 gallery!